Michael P. DeRose - Crivelli & Barbati, L.L.C. Michael P. DeRose - Crivelli & Barbati, L.L.C. Mr. DeRose has tried and/or participated in the trying of several civil jury trials, administrative bench trials, and bench trials in the family court. He also served as lead counsel on In re Lumber Company, 2014, where he successfully validated the wrongfully-deposed board of directors for a multi-million lumber company placing his clients back in control of the corporation. Mr. DeRose has also obtained favorable outcomes for his clients in a number of divorce/ family law cases, municipal court cases, and landlord tenant matters. Before joining the firm in August of 2015, Mr. DeRose was an associate counsel at a civil litigation and family law firm out of Trenton, New Jersey, where he focused his practice around those two areas of the law since September of 2013. Before his tenure at that firm, Mr. DeRose served as a law clerk in the Superior Court of New Jersey for the Honorable F. Patrick McManimon, Mercer County Vicinage, from September of 2012 to August of 2013. There, he mediated well-over one-hundred cases, primarily related to commercial and residential landlord/ tenant disputes, contract/ business litigation, and a plethora of other civil matters. He also assisted Judge McManimon in conducting a significant number of settlement conferences where they settled many civil cases pending in the Mercer County Law Division. Mr. DeRose also served as a law clerk for the Honorable Douglass H. Hurd, the presiding Civil Judge in Mercer County, and for the Honorable Anthony M. Massi, also of the Civil Division. The primary focus of his assignment with Judge Hurd and Judge Massi involved analyzing and summarizing opposing arguments and drafting judicial opinions in labor and employment lawsuits, personal injury cases, medical malpractice cases, and business and contract disputes. Prior to his clerkship with the Superior Court of New Jersey, Mr. DeRose served his law school externship for the Hon. G. Patrick Hillary, a family division Judge for Kent County Circuit Court in Michigan. During this time, he mediated custody and divorce cases and and various issues pertaining to family law. 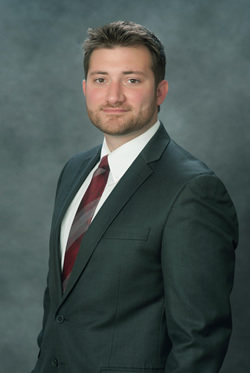 Mr. DeRose also completed a legal internship with the Mercer County Prosecutor’s Office where argued municipal court appeals, conducted bail and sentencing hearings, and presided over grand jury indictements. Mr. DeRose earned his Juris Doctorate in 2012 after graduating from the Western Michigan University-Thomas M. Cooley School of Law. In 2007, he earned his Bachelor of the Arts in Criminal Justice and Public Administration from Kean University where he was a member of the Kean University baseball team and vice president of the Alpha Phi Sigma chapter of the National Criminal Justice Honor Society. Mr. DeRose is admitted to the New Jersey State Bar, the United States Federal Court for the District of New Jersey, and is a member of the Mercer County Bar Association.